Two newly published studies detail the discovery of a precancerous state found in blood, paving the way for research that focuses on detection and prevention of blood cancers. Researchers from the Broad Institute of MIT and Harvard, Harvard Medical School, the Harvard Stem Cell Institute (HSCI), and Harvard-affiliated hospitals have uncovered an easily detectable, “premalignant” state in the blood that significantly increases the likelihood that an individual will go on to develop blood cancers such as leukemia, lymphoma, or myelodysplastic syndrome. The discovery, which was made independently by two research teams affiliated with the Broad and partner institutions, opens new avenues for research aimed at early detection and prevention of blood cancer. Findings from both teams appear this week in the New England Journal of Medicine. Most genetic research on cancer to date has focused on studying the genomes of advanced cancers, to identify the genes that are mutated in various cancer types. These two new studies instead looked at somatic mutations — mutations that cells acquire over time as they replicate and regenerate within the body — in DNA samples collected from the blood of individuals not known to have cancer or blood disorders. Taking two very different approaches, the teams found that a surprising percentage of those sampled had acquired a subset — some but not all — of the somatic mutations that are present in blood cancers. These individuals were more than 10 times likelier to go on to develop blood cancer in subsequent years than those in whom such mutations had not been detected. The “premalignant” state identified by the studies becomes more common with age; it is rare in those under the age of 40, but appears with increasing frequency with each decade of life that passes, ultimately appearing in more than 10 percent of those over the age of 70. Carriers of the mutations are at an overall 5 percent risk of developing some form of blood cancer within five years. This “premalignant” stage can be detected simply by sequencing DNA from blood. “People often think about disease in black and white — that there’s ‘healthy’ and there’s ‘disease’ — but in reality most disease develops gradually over months or years. These findings give us a window on these early stages in the development of blood cancer,” said Steven McCarroll, senior author of one of the papers. McCarroll is an assistant professor of genetics at Harvard Medical School and director of genetics at the Broad’s Stanley Center for Psychiatric Research. Benjamin Ebert, co-director of the HSCI Cancer Program, associate member of the Broad, and associate professor at Harvard Medical School and Brigham and Women’s Hospital, is the senior author of the other paper. The mutations identified by both studies are thought to originate in blood stem cells, and confer a growth-promoting advantage to the mutated cell and all of its “clones” — cells that derive from that original stem cell during the normal course of cell division. These cells then reproduce at an accelerated rate until they account for a large fraction of the cells in a person’s blood. The researchers believe these early mutations lie in wait for follow-on, “cooperating” mutations that, when they occur in the same cells as the earlier mutations, drive the cells toward cancer. 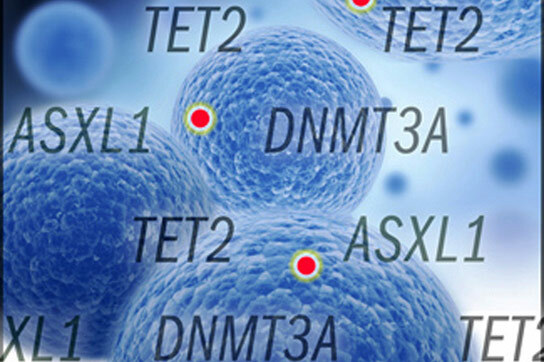 The majority of mutations occurred in just three genes; DNMT3A, TET2, and ASXL1. The teams converged on these findings through very different approaches. Ebert’s team had hypothesized that, since blood cancers increase with age, it might be possible to detect early somatic mutations that could be initiating the disease process, and that these mutations also might increase with age. They looked specifically at 160 genes known to be recurrently mutated in blood malignancies, using genetic data derived from approximately 17,000 blood samples originally obtained for studies on the genetics of type 2 diabetes. They found that somatic mutations in these genes did indeed increase the likelihood of developing cancer, and they saw a clear association between age and the frequency of these mutations. They also found that men were slightly more likely to have mutations than women, and Hispanics were slightly less likely to have mutations than other groups. Ebert’s team also found an association between the presence of this “premalignant” state and risk of overall mortality independent of cancer. Individuals with these mutations had a higher risk of type 2 diabetes, coronary heart disease, and ischemic stroke as well. However, additional research will be needed to determine the nature of these associations. In the related paper, McCarroll’s team discovered the phenomenon while studying a different disease. They, too, were looking at somatic mutations, but they were initially interested in determining whether such mutations contributed to risk for schizophrenia. The team studied roughly 12,000 DNA samples drawn from the blood of patients with schizophrenia and bipolar disorder, as well as healthy controls, searching across the whole genome at all of the protein-coding genes for patterns in somatic mutations. They found that the somatic mutations were concentrated in a handful of genes; the scientists quickly realized that they were cancer genes. The team then used electronic medical records to follow the patients’ subsequent medical histories, finding that the subjects with these acquired mutations had a 13-times elevated risk of blood cancer. McCarroll’s team conducted follow-up analyses on tumor samples from two patients who had progressed from this premalignant state to cancer. These genomic analyses revealed that the cancer had indeed developed from the same cells that had harbored the “initiating” mutations years earlier. “The fact that both teams converged on strikingly similar findings, using very different approaches and looking at DNA from very different sets of patients, has given us great confidence in the results,” said Giulio Genovese, a computational biologist at the Broad and first author of McCarroll’s paper. “It has been gratifying to have this corroboration of each other’s findings. Jaiswal will present the findings on Dec. 9 at the American Society of Hematology annual meeting in San Francisco. All of the researchers involved emphasized that there is no clinical benefit today for testing for this premalignant state; there are no treatments currently available that would address this condition in otherwise healthy people. However, they say the results open the door to entirely new directions for blood cancer research, toward early detection and even prevention. Ebert agreed: “A new focus of investigation will now be to develop interventions that might decrease the likelihood that individuals with these mutations will go on to develop overt malignancies, or therapeutic strategies to decrease mortality from other conditions that may be instigated by these mutations,” he said. The researchers also say that the findings show just how important it is to collect and share large data sets of genetic information: Both studies relied on DNA samples collected for studies completely unrelated to cancer. Be the first to comment on "Researchers Uncover an Easily Detectable Precancerous State in Blood"